April 2 – April 3. View looking south over Half Moon Bay at Little San Salvador. Tuesday April 2nd was the start of a weather window we could use to travel to Eleuthera. We’d have lighter wind the first couple of days, with an increase as the next front approached. We chose to travel with the lighter wind. Our first stop would be Little San Salvador 18 miles directly to the west. We left Bennet’s Harbor mid-morning when there was just enough breeze to sail off the anchor. It was a nice lazy trip. After the sails were fine tuned Duwan didn’t really need to touch the helm. She could even quiz me with Trivial Pursuit questions. There was plenty to see. Before Cat Island faded completely behind us the Long Rocks appeared ahead. A pair of dolphins played around our bow then zoomed off. Then Little San Salvador appeared. But we kept losing speed as the wind slowly died. With two miles left, we finally cranked the engine and motored into Half Moon Bay, parking near three other boats at the north end. Colorful buildings on the beach, waiting for the next cruise ship to come in. 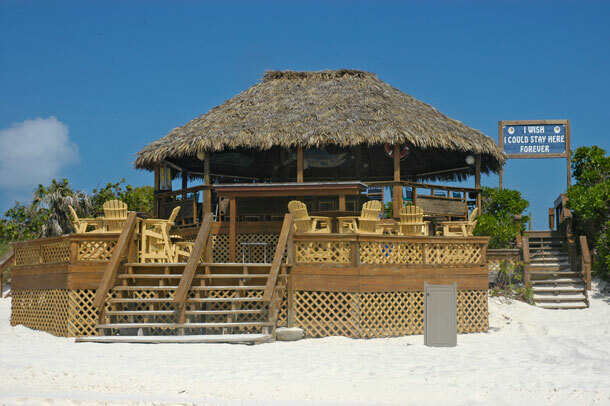 Tiki bar at Half Moon Bay. 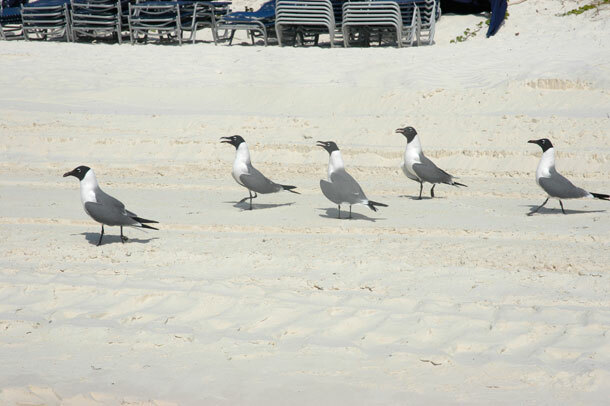 These laughing gulls are enjoying their private beach. This restaurant is in ship-shape. 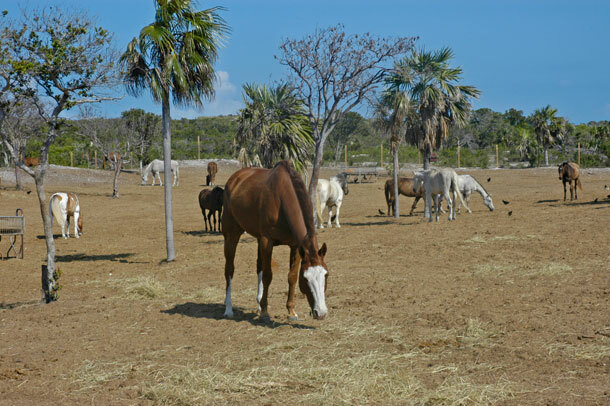 In addition to normal beach-side activities, the resort here has horseback tours of the island’s trails. Here are some of the horses at the Pegasus Ranch. The south end of the bay is a stop for cruise ships. We learned from Herb and Linda on Utopia that a cruise liner had been there Monday and another was coming Wednesday. Since it was an off day we were welcome to go ashore and explore. What a nice surprise. We had perfect weather and the bay wasn’t filled with para-sailors and jet skis. 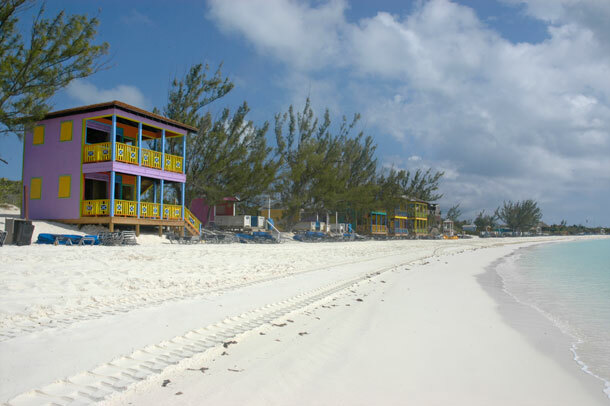 Next was stop the familiar island of Eleuthera. I woke at 6am to the sound of tractors grooming the beach. We motored out of Half Moon Bay at 7am making sure we didn’t interfere with the big incoming Carnival cruise ship. Then is was sails up. 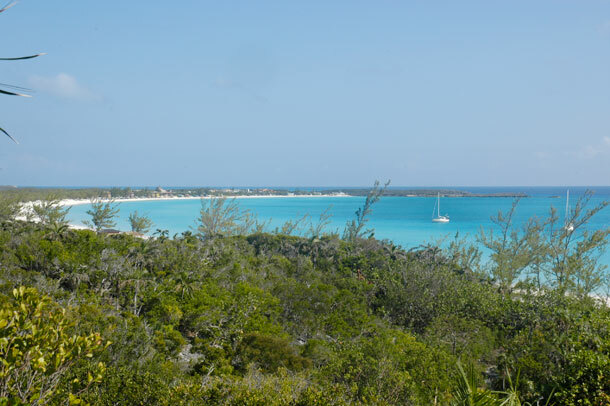 The southmost tip of Eleuthera was ten miles directly west. We sailed southwest first. Then Duwan timed our jibe perfectly to sail northwest close by the tip of the isle. Next I took us up the 15 mile stretch to round Powell Point. Here we were hit on the nose by 15 mph gradient wind with another 5 mph of sea breeze piled on top. We had to motor through choppy Davis Channel, a four mile stretch between two big shallow bars. We had picked the right day for this. The wind would be stronger tomorrow. After clearing the channel it was sails up for the four mile southeast run to Poison Point. I was happy we had been here before and knew that the water in this stretch is really three feet deeper than the charts indicate. At Poison Point we tacked. At first it appeared we would be able to pass the shallows off Sound Point one mile ahead. But no. It took another tack for us to round this point. Then Duwan lined up our destination perfectly for the final tack. Now we are back in Rock Sound, Eleuthera, where there is free water, wi-fi, a great grocery store, and no tidal surge. 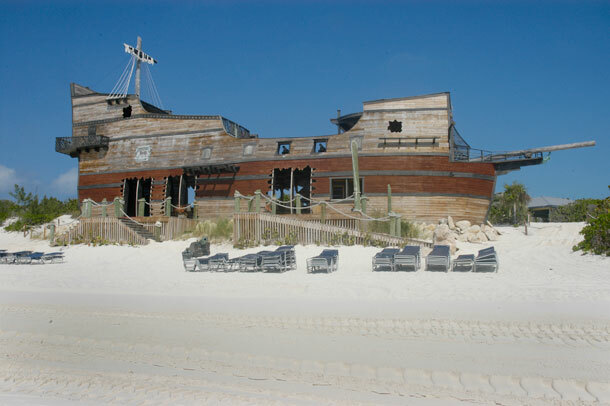 This entry was posted in Life on the Water, Little San Salvador, The Bahamas. Bookmark the permalink.